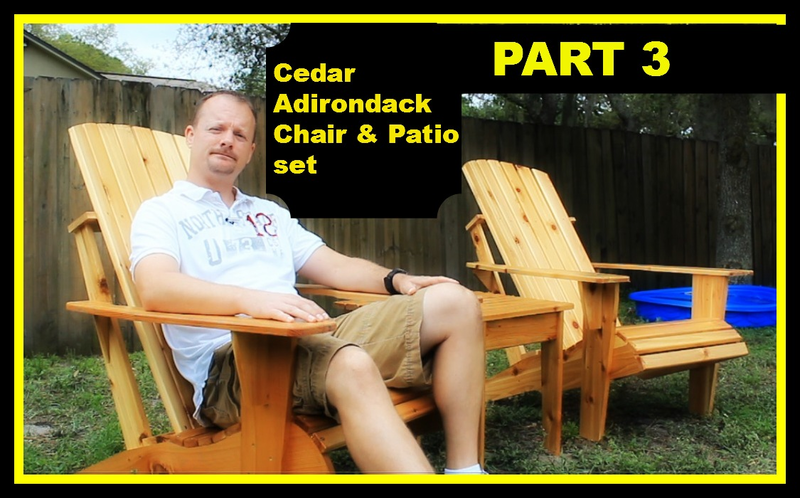 This is part 3 of the Cedar Adirondack Chair and Patio Set build. If you missed Part 1 Click here! If you missed Part 2 Click here! So far we have covered the cutting and shaping of all the parts. We have even started some of the assembly. Next come the front legs. Just make sure the cut that I pointed out in part 2 is flat on a level surface and clamp the front legs to the seat frame. 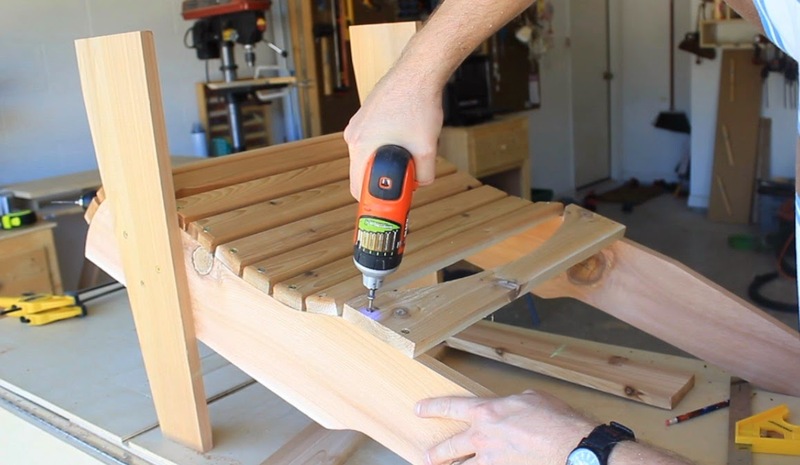 To make sure both front legs are even, I used the front of the third seat slat as a reference point. After I have the legs clamped in place I’ll predrill 3 holes. 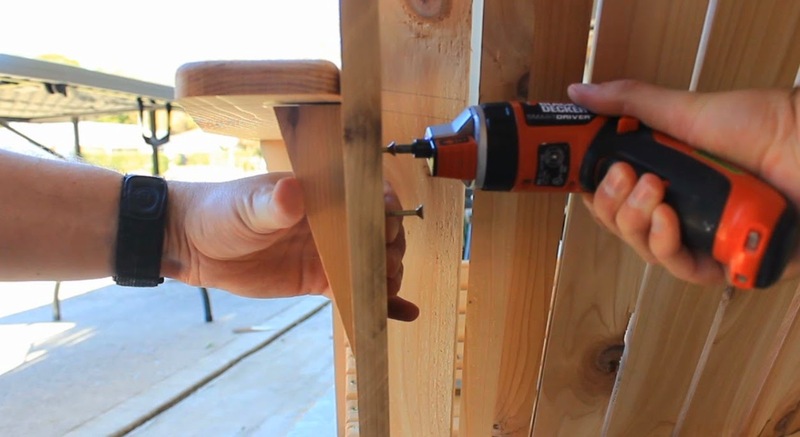 Countersink. Secure with one and a quarter inch screws. Same thing for the other side. Remove the clamps and attach the lower back support brace. Next I’ll attach what I will refer to as the rear legs. Mine do not make contact with the ground, although in some designs they do. Common practice would have these perpendicular to the ground. Which would allow for that contact. However, that leaves you having to figure an unknown angled cut at the top in order to attach this upper brace. So I decided to swing the bottom of my legs forward and make it parallel to the seat back in order to eliminate having to figure what the angle would be. 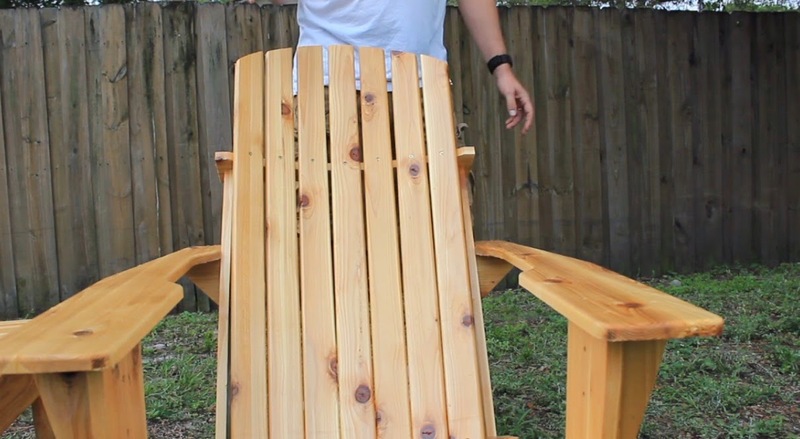 Also by doing that it allows me to set the recline of the chair later in the project instead of having to do it now. I am only going to place one screw on the bottom at this stage. More will be added later when I set the angle of the seat back. For the upper back support brace I’ll place it flush on top of the lower one and mark where the legs are. Now when I attach it to the top I’ll line the legs up with those marks. 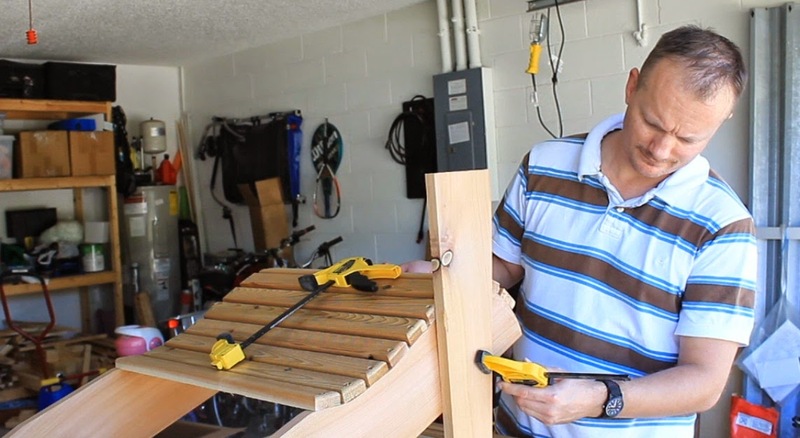 The arm rest braces I cut from 1x4’s and the length is personal preference. I have seen these extend down the length of the front legs before, its up to you. I cut a slight angle on mine in order to stay in step with my overall design. I’ll mark from below the armrests where the front leg and brace will be. Then I’ll flip it over onto a scrap piece and predrill holes inside those marks. 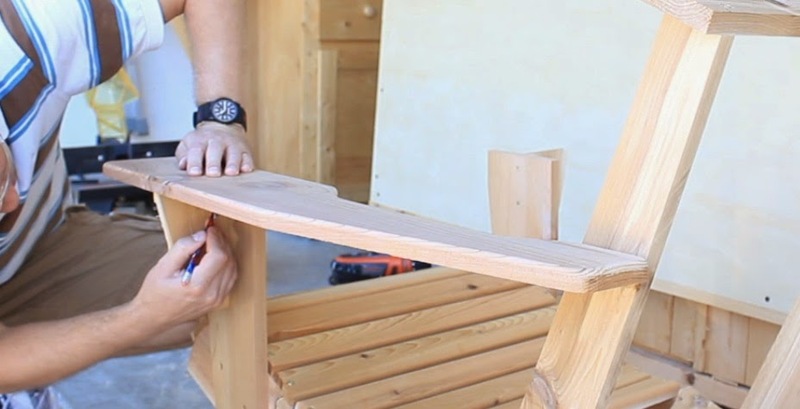 The scrap piece is to minimize any major tear out on the top side of the armrest. 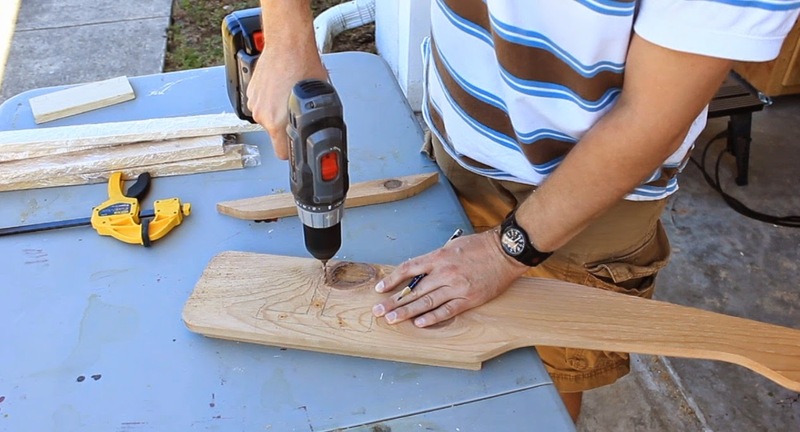 Then flip it over and countersink from the top. Take it back to the chair. Realign those same marks from the bottom. And attach with one and a half inch screws. The second armrest is done the exact same way only I want to make sure the overhangs match. To attach the seat slats I started with the middle one marking the center of the back support. Then the two outside slats. 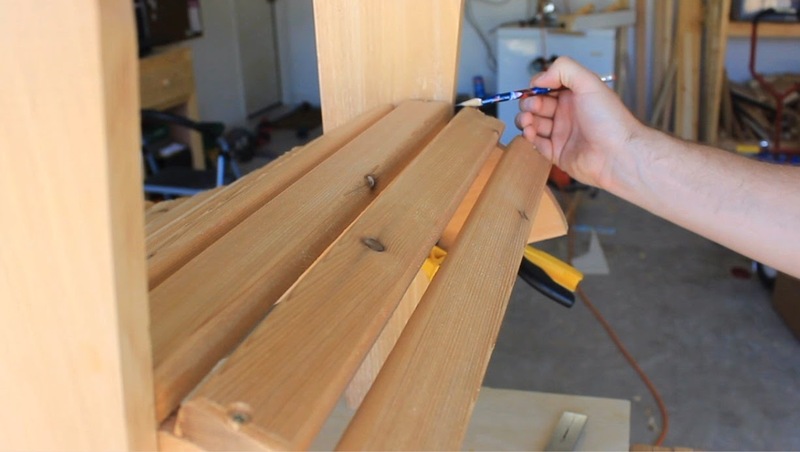 Then I just made sure the rest of the slats where equally spaced. I held off attaching the rear armrest braces until I had the angle of the seat back set to where I wanted it. 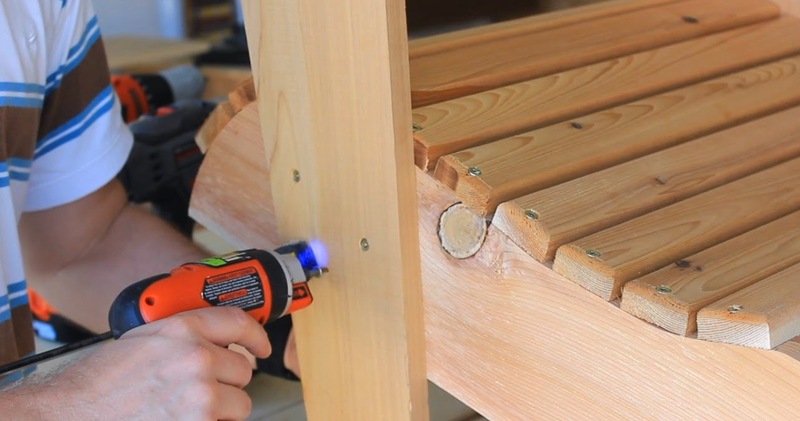 Set the final screws in the bottom of the rear legs. Attaching the seat slats and cutting this curve was not as simple as laying the slats next to each other on a flat surface and drawing an arc like I showed you in part 2. Because that wouldn’t take into account the curvature of the seat back. Now I could have left the back slats as they are and called this done. However, this is where I decided to mark my radius. 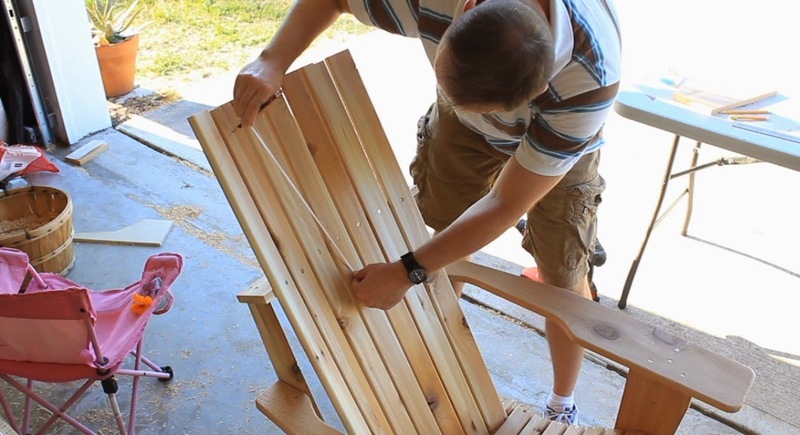 Remove the seat slats. Make the cuts on each piece. Sand if I needed to. Reattaching was easy as I already had the reference points. After that secure the bottom of the back slats. 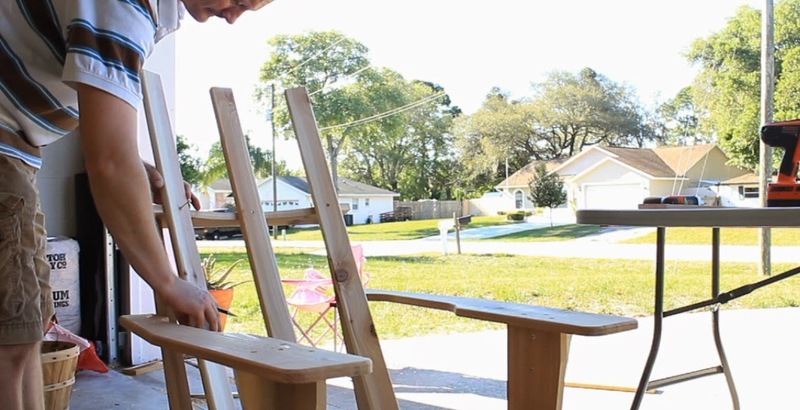 I made two chairs. One of them I just ran the back slats straight up and down. The other one I attached in the same manner I just showed you however, at the bottom I pushed everything together and it gave me more of a fanned look. 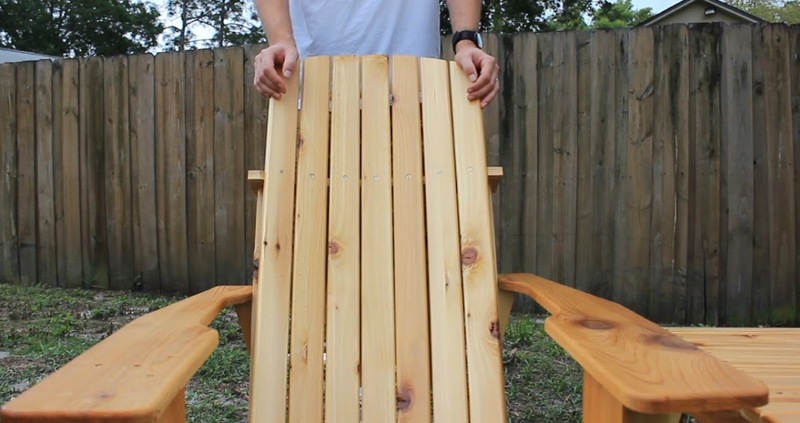 Also the second one has more of a recline to the back and is a little wider. 2 1x6 Seat Frames @ 36"
2 1x6 Front legs @ 20"
2 1x4 Rear Legs @ 26"
1 1x4 Upper back support brace @ 19"
1 1x4 lower back support brace @ 19"
2 1x6 Armrests @ 31"
2 1x4 Front armrest braces @ 6"
If you should happen to make a few of these for your family, don't be shy. Lets admire the good work together. Visit my contact page and shoot an email. Your material list is just for 1 chair correct?